Few concepts rooted in classical antiquity have a history so uninterrupted and lastingly relevant as virtus. The study by Silke Schwandt is an important contribution to our understanding of this concept and the development of its meaning, particularly in the period of the early Middle Ages. 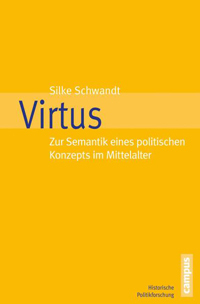 The overall setup of Schwandt's work follows the approach to virtus as a political concept expressed in the book's subtitle. This approach comes forward in the selection of sources, to which issue Schwandt spends the entire second chapter. In this chapter the author reflects on the specific problems regarding the material she is dealing with, taking into account aspects that influence the extent to which the chosen sources are representative, such as survival bias, the character of the sources' audiences, and the nature of their language: Latin (16). Schwandt's choice of sources is not the outcome of a search through the available (digital) databases following the term virtus where it goes. Rather, the author works on an initially defined corpus that allows for a diachronic comparative analysis. To typify the genre of this corpus the author borrowed the term "Gemeinschaftsspiegel" from Hans H. Anton: texts that reflect on and/or design a society and its ruler in the light of reform (Anton's definition is given in full in footnote 37). The result of this approach is the analysis of four main texts "next to the Bible" (20): Augustine's De civitate dei; Gregory the Great's Regula pastoralis; Smaragdus of St Mihiel's Via regia, and John of Salisbury's Policraticus. The method chosen to address this corpus, explained in chapter 3, is based on a quantitative analysis of co-occurrences: words that occur in a previously defined context around virtus. The quantitative data for each of the four works chosen are presented separately in the appendix (224-227). Central to the analysis is the charting of the contexts of use ("Gebrauchssituationen", 29) within Niklas Luhmann's sociological framework of "Gepflegte Semantik" (10) as the historical context in which a term acquires meaning or certain semantic elements of a term are brought up to date (125-126). In this contextual approach "Sollbruchstellen" indicate the moments in which the meaning of a term is stable ("stabil") or liable to change (10; 28). The heart of the book is then formed by the three parts (ch. 6-9) in which the three most meaningful aspects of virtus are studied in the four chosen authors: virtus as ethical norm ("moralische Norm"), as personal power ("persönliche Kraft"), and as (divine) power working in a person ("Wirkmacht"). The net result of Schwandt's diachronic approach is the establishment of the most decisive breaking point ("Sollbruchstelle") in and through the work of Augustine, where the most crucial "Christianisation" of virtus took place; a process of increasing stability in the works of Gregory and Smaragd; and, finally, a renewed link with the classical past (Aristotle) in John of Salisbury (112). The liberty with which John of Salisbury falls back on the pre-Christian past is explained by Schwandt with reference to John's context of a more deeply christianised society in comparison to the earlier authors, in which the concern to establish a (new) christian outlook is less dominant than the (re-)introduction of classical philosophy in an already christian world (102-103). The quantitative analysis is carried out with the help of digital tools presented concisely in footnote 74. Other quantitative data are likewise given in the appendix, most importantly pie charts of "Bedeutungsaspekte" (219-221) and of the division of grammatical cases (221-223). The latter is particularly illustrative for the (instrumental) ablative in virtute, further commented on in chapter 8 (131-132). Thus, the technical information in terms of complex data of use and co-occurrences but also of grammatical specificities that underlie the book are present in a clear overview (Appendix) without obstructing the fluency of the reading process. The main question that presents itself when reading Schwandt's Virtus concerns the chosen research direction, working from a previously selected corpus of texts to conclusions with regard to semantic development. While reading the work I kept wondering what the result would have been had the opposite direction been chosen, i.e., following the term virtus where it leads and establishing the relevant corpus as a result of this search. This direction seems to be a plausible alternative given the author's apparent affinity for scholars she presents as granting Begriffe a large measure of autonomy, considering them even as "vorzeitig" to societal change (13: Urs Stäheli, Bernhard Jussen) and as empowered to "change the shape of society" (191). The result of the chosen direction is a concise monograph, discussing sources that are indeed fit for a comparative study. What remains hidden by this approach, however, is the variety of sources in which virtus appears in the period between the early fifth and the XIIth centuries. This loss is caused by the explicit choice to exclude saints' lives, literature on vices and virtues, and sermons (28) - sources in which society at large is probably reflected more strongly than in the four works discussed. 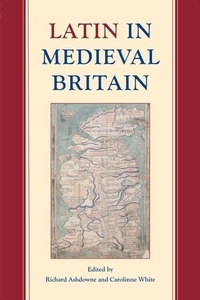 It is even questionable whether the political discourse of the early medieval period is covered by the limited number of the works chosen and their relative homogeneity. A free search of virtus in the available (digitalised) text corpora of the early Middle Ages would have added to our knowledge about what kind of authors and texts helped shape the "contemporary political theory", now attributed to a "relatively fixed group" (33). If we look at the "genres" now excluded, such as hagiography and sermons, we must acknowledge the not negligible political role of these texts in the early medieval period, as is sufficiently demonstrated in recent scholarship. What we also miss due to the limited choice of sources is the translation of Aristotle's virtus as an exclusive characteristic of male citizens (37) into a term relevant to describe the ideal profile of all members of the (christianising) community - including those without direct political power but with a huge impact on society (saints!) as well as, e.g., women. Moreover, a free search of virtus in early medieval sources would probably have bridged the traditional gap between late Antiquity (Augustine, Gregory) and the Carolingian period (Smaragd). This choice, finally, would also have provided a more nuanced approach to the relation between "state" and Church (33-34). In ch. 4 this now takes the shape of a rather schematic opposition between imperium and sacerdotium, which leads, in detail, to the surprising characterisation of Mayke de Jong's work on ecclesia as a "church historical perspective" ("aus kirchengeschichtlicher Perspektive") on the problem of "Staat" in the early Middle Ages (31, footnote 81). Further on in ch. 7, the interdependence of secular and spiritual authority is indicated more adequately with the help of Hipshon's work on Gregory the Great's views and influence on the matter (77-78). What we gain thanks to Schwandt's work is not only a concise history of the meaning and semantic change of Virtus as a political concept in the early Middle Ages but also a (if not the only) relevant model of the practice of historical semantics to study this period. Hagiography: Jamie Kreiner: The Social Life of Hagiography in the Merovingian Kingdom, Cambridge 2014; sermons: Maximilian Diesenberger: Predigt und Politik im frühmittelalterlichen Bayern, Berlin 2016.